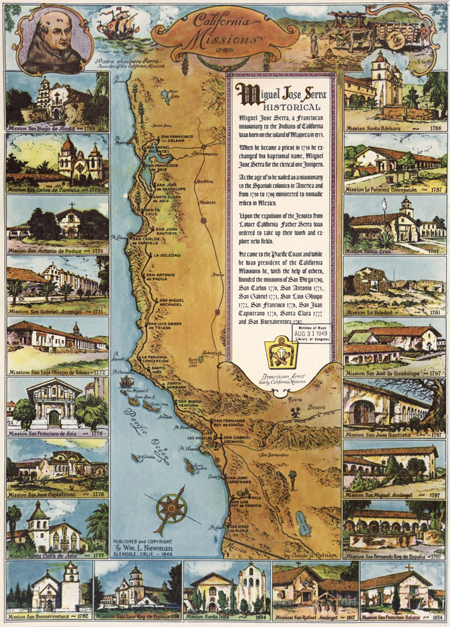 Today in History–January 12–the Library of Congress features the missions of Old California. On this date in 1777, Padre Thomas Peña founded Santa Clara de Asís, the eighth of California’s twenty-one missions. The first mission—San Diego de Alcala—was founded in 1769 by Padre Junípero Serra, who also oversaw the founding of the next eight, and the last—San Francisco de Solano—was founded in 1823. The missions dotted the California coast from San Diego to Sonoma along El Camino Real (the Royal Road), each about one day’s journey by horse from the next. Find out more by visiting the Today in History section, then follow the links below to access related primary and secondary sources.